Seating Matters chairs have been designed by Martina Tierney OT and clinically trialled around the world. Every chair and accessory has been developed and engineered to offer optimum quality, safety and support for both users and care givers. The Milano takes the clinical features, the quality and durability for which Seating Matters is known and puts it into an accessible, universal chair. Designed for facilities and contracts, the Milano is perfect for multiple users and can easily be adjusted to fit different patients. With impressive strength and durability, the Milano helps reduce costs for equipment loan stores, acute care facilities, and nursing homes due to its ease of use and universal design. 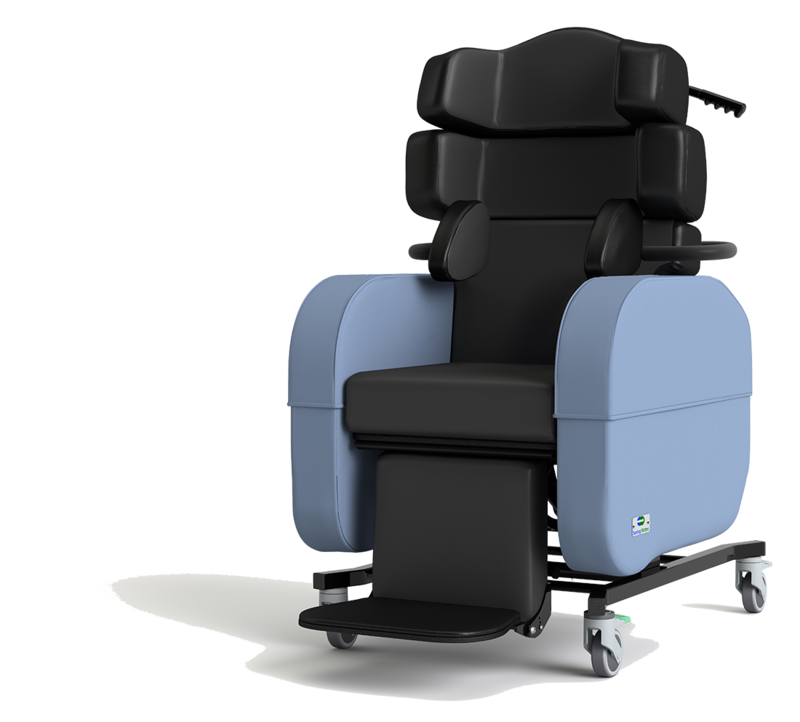 The Milano tilt in space chair gives support, comfort and pressure management to patients who have low to medium support needs and those who may still maintain a degree of mobility. Ideal for stand transfers, the Milano works well with patient lifts. Lower limb swelling and edema. Light and easy to manoeuvre, the Milano features push handles and castors that allow patients to be transported in the chair and through standard door frames. The MIlano is made for easy cleaning and adjustable parts help suit a wide range of clients. 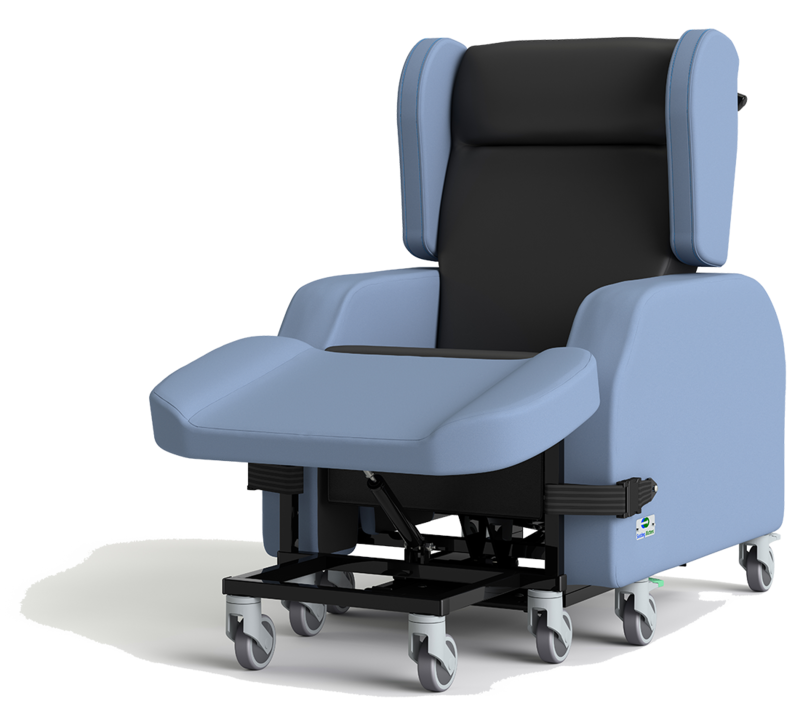 The Phoenix is the most supportive and functional of the Seating Matters chairs to accommodate spinal conditions that require maximum support for highly dependant patients. Clinically designed for complex upper body support in addition to pressure management, postural support and comfort, the Phoenix easily adapts to the changing needs of a person being rehabilitated or to meet the long term needs of a progressive condition. The Phoenix provides maximum support for the upper body with a unique head support for patients with complex postural needs and spinal problems. Designed for posture care, pressure care, early mobilization and safe patient handling, the Phoenix is suitable for the most complex level of care. The adjustable shoulder and head supports can perform to the person’s individual posture and position with fast and easy adjustments. At Seating Matters we take infection control seriously. Our chairs have been specifically designed to decrease entrapment areas where bacteria and germs can survive. Our chairs feature a velcro-free design and can be easily taken apart for quick and effective cleaning. With its adaptability and effortless adjustability, the Sorrento is a simple to operate and functional chair which is designed to improve and maximise comfort as well as provide postural support and pressure management. The Sorrento tilt in space chair is clinically designed for the patient but has the caregiver in mind with ease of use designed into the chair. Used widely in hospitals and rehabilitation units, the Sorrento provides comfort, support, security and long term benefit to the user. The chair has been proven to reduce pressure, prevent sliding and falls from the chair and encourage early mobilization for patients who spend the majority of their time in bed. Optional lateral supports and supportive pillows can help to maintain or improve posture and facilitate functional ability in activities of daily living such as eating and communicating. The correct use of these features and clinical accessories can also reduce common problems such as falling to the side when seated. The Atlanta has been carefully crafted for safety and security and is our very best in falls prevention. A robust and durable chair provides a safe and comfortable seat for those with vigorous involuntary movements while reducing the risk of falling from the chair. 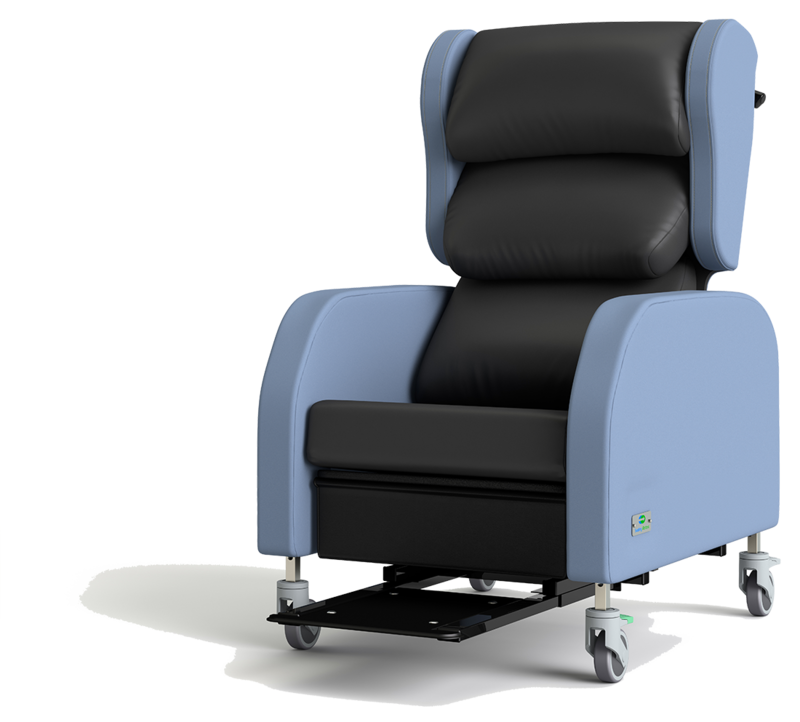 The Atlanta is necessary to comfortably accommodate individuals who may be challenging to seat, designed originally for patients suffering from Huntington’s disease and has become widely used for patients with late stage Dementia. The Atlanta has been designed with strength and stability to withstand rigorous use. The Atlanta is successfully used in the management of lower limb oedema. The variable angle leg rest used in combination with the integrated tilt and recline helps to elevate the feet higher than the heart which is the optimum position for fluid drainage. Individuals with tight hamstrings and contracted legs can also be accommodated due to the negative angle clearance underneath the seat which allows the feet to retract behind the knee without compromising the person’s position in the chair. The Monaco has been designed for comfort and mobility with independence at the forefront of its design. The Monaco reduces sliding, discomfort and shear as it helps to maintain positioning of the pelvis. 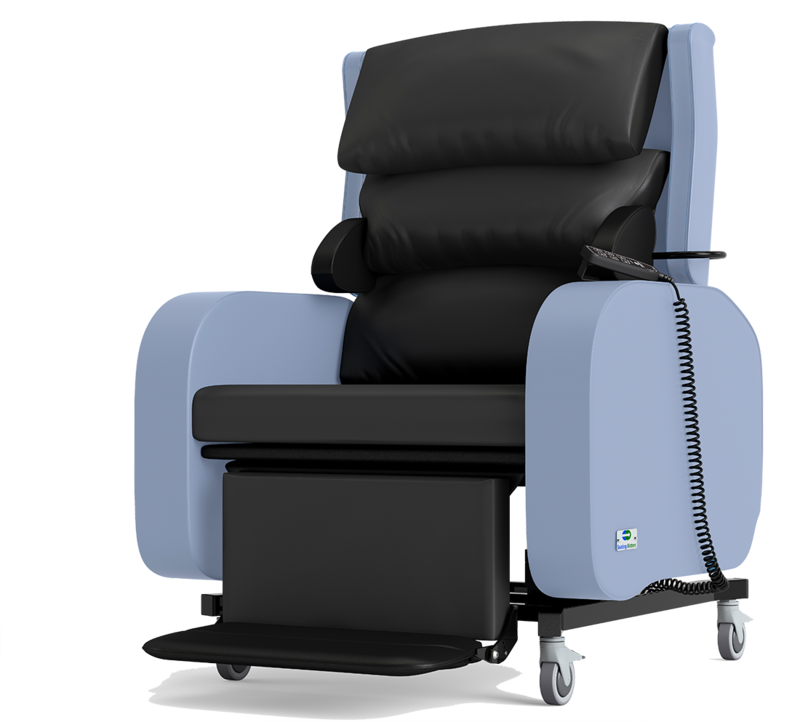 Its low seat to floor height makes it easy to strand from, making it a multi-functional comfort chair recommended for mobile patients. Optional lateral supports and supportive pillows can help to maintain or improve posture and facilitate functional ability in activities of daily living such as eating and communicating. The correct use of these features and clinical accessories can also reduce common problems such as falling to the side when seated. The Monaco Assist™ is also available in certain regions. Designed to facilitate a stand transfer from the chair using powered riser seat function. Together with adjustable back recline, waterfall back, optional lateral supports and pressure management materials, a high level of positioning and pressure redistribution is achievable without compromising the function or independence of the user. The Monaco accommodates those with tight hamstrings as the negative angle clearance underneath the seat is designed to facilitate safe retraction of the feet behind the knees, ensuring the user’s is not dangerously pulled down the chair into a posterior pelvic tilt or sliding position. The optional variable angle leg rest can be used to elevate the lower limbs and assist in the management of oedema. The inclusion of swivel castors, push handle and sliding footplate facilitate easy mobility and access to other environments within the home or care facility. Seating Matters’ product development has evolved from patient needs from over 30 years of experience of Occupational Therapy. It took careful planning to ensure our chairs were functional as well as being aesthetically pleasing. Our design team are adamant that the chairs need to be designed in such a way that they fit into a home environment. Each and every part of a Seating Matters chair has been engineered and devised to offer optimum quality and support for the user. The entire Seating Matters range has undergone an impressive level of rigorous testing. By investing in our in-house testing facility we have raised the bar for testing standards in the field of medical equipment. Each chair model is specifically designed for stability, ensuring that it has a low center of gravity and a wide, stable base. This offers a high level of safety and occupant protection, even when in maximum tilt in space. Have total peace of mind when relaxing in a Seating Matters chair as each one has passed the world’s most stringent standards of strength, durability and safety. That’s why we can uphold an industry leading 7 year manufacturer’s warranty* with total confidence.